HBO is building the anticipation for the premiere of Game of Thrones by releasing a hip-hop and reggaeton mixtape, “Catch The Throne,”with lyrics inspired by the series and its themes of battles and power struggles. The free sampling, which drops this Friday, will be featuring rappers like OutKast’s Big Boi, Daddy Yankee, Wale and Common. Check out the link below to hear Common’s contribution to the mixtape, entitled “The Ladder”. 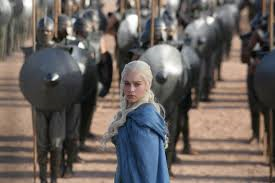 If you thought that was something, listen to the first track by Big Boi’s, “Mother of Dragons” the song was inspired by Khaleesi. Once you listen to this and you might just have the phrase “dungeons, dragons, kings and queens” stuck in your head for the rest of the day. The free compilation will be available for download on March 11 via SoundCloud at SoundCloud.com/CatchTheThrone. Meanwhile, Common will perform his track — which includes “several allusions to Season 3’s infamous ‘Red Wedding’,” according to Billboard — at a special HBO party at SXSW on March 7. “Game of Thrones” Season 4 premieres April 6 at 9 p.m. ET/PT on HBO.